The August 21st, 2017 solar eclipse is poised to be one of the most spectacular celestial events of the year. And, surely, it will be a pleasant sight for anyone who loves looking up at the sky, like most of us who are members of or love to follow The Planetary Society! 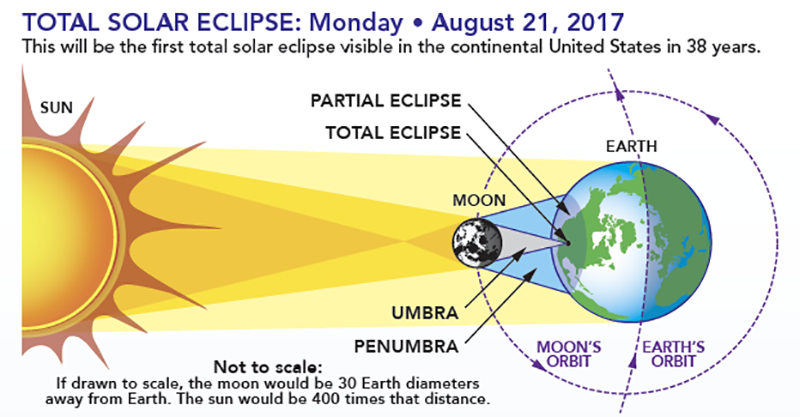 But the eclipse isn't just about watching the moon block out the sun, or even about what we can visibly "see." In fact, there's so much going on that is invisible to our eyes that NASA has selected 11 ground-based science experiments to study the unseen effects of the eclipse. The eclipse's long path and wide swath across the continental United States will provide an opportunity to study the Earth's upper atmosphere, the Sun, the moon, and how all three interact with one another. The sun is a prominent driver in the dynamics of a region of the upper atmosphere called the ionosphere. Solar radiation from the sun's corona, or outer atmosphere, in the "extreme ultraviolet" (EUV) portion of the electromagnetic spectrum (10 nanometers to 124 nanometers) charges particles in this is region, causing it to fluctuate in density depending on the amount of radiation it receives. As it is, the ionosphere grows and shrinks diurnally (day and night). A total solar eclipse effectively "turns off" the ionosphere's primary driving force, mimicking night-time conditions. With a reduced quantity of ionizing, EUV radiation, the ionosphere will decrease in density and expand, as it does at night. Disruptions in the ionosphere caused by solar activity or space weather can cause problems for certain satellites. 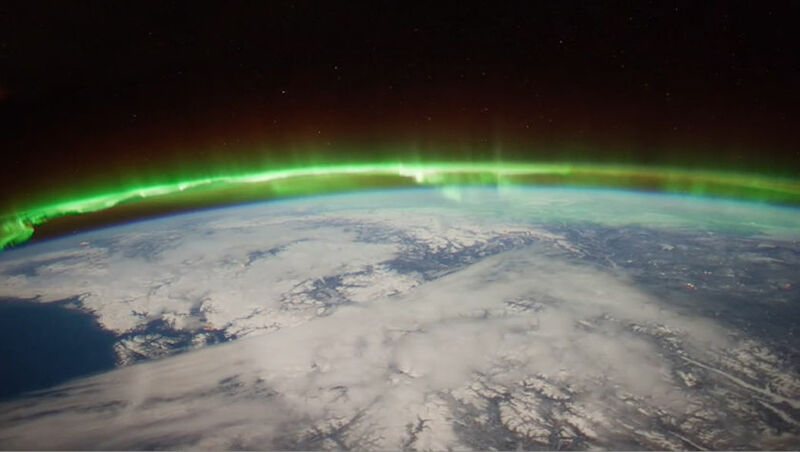 The ionosphere extends between 75 and 1,000 kilometers (km) above the Earth—or 46 to 621 miles, which is the prime location for Earth observation satellites and even the International Space Station, which orbits the Earth at only 249 miles. In fact, the "low Earth orbit" (LEO) region for Earth observation satellites extends from 100 to 1,200 miles, with most of NASA's polar-orbiting satellites in this region. The Hubble Space Telescope also orbits the Earth in LEO, at a height above the Earth's surface of only 340 miles. Needless to say, keeping these satellites operating properly requires a precise understanding of ionosphere dynamics and effects. The ionosphere is also an important facet of many kinds of communications. 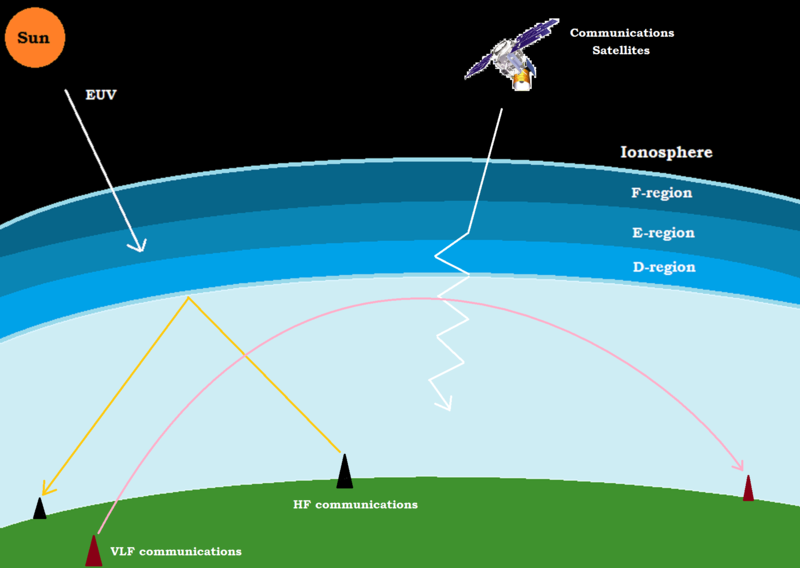 Besides being a medium for signals propagating from satellites down to Earth's surface, ground-based radio communications often exploit, intentionally or unintentionally, the fluctuating characteristics of the ionosphere. As the density of charged ionospheric particles changes, the ability of the ionosphere to interact with long-wavelength, low-frequency radio waves fluctuates as well. The ionosphere effectively acts like a conductor, while the Earth's surface operates as a ground plane, creating a kind of large "waveguide" through which extremely-low frequency (<3,000 Hz) and very-low frequency (3,000 Hz to 30,000 Hz) waves can propagate. 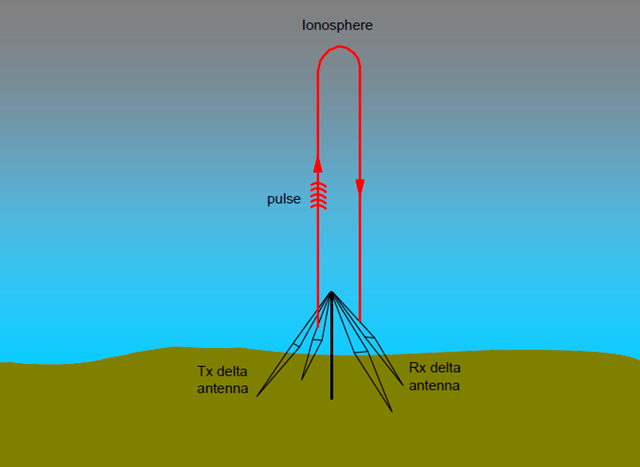 High frequency (3 MHz to 30 MHz, where the "M" is a multiplication factor of 1,000,000) waves are also reflected by the ionosphere, allowing us to exploit these signals for very long-range detection by a technique called over-the-horizon radar. So, the ionosphere can help us track distant, over-the-horizon objects, as well as allow us to communicate far beyond that horizon. Of the 11 experiments to be conducted during the eclipse, three will study the ionosphere. The first will specifically focus on ionospheric changes induced by the solar eclipse and will be led by Dr. Phil Erickson, the assistant director of MIT's Haystack Observatory. His team will use over 6,000 ground-based GPS sensors, in addition to the powerful radar systems at MIT and Arecibo in Puerto Rico, data from NASA satellites like TIMED, and data collected by citizen radio scientists. The goal is to track traveling ionospheric disturbances which are related to space weather patterns in the upper atmosphere. Sometimes these disturbances are related to atmospheric gravity waves, which are a phenomenon that can be triggered by eclipses (but are not necessarily always triggered by eclipses). 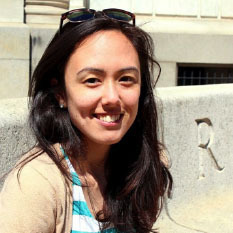 The second project is led by Dr. Greg Earle at Virginia Tech. His team will be situated in different states along the eclipse's path, from Oregon, to Kansas, to South Carolina. They will use instruments called ionosondes, which are special kinds of radar that look up into the ionosphere to measure its height and density. They'll look into a higher region of the ionosphere than the MIT team, called the "F-region", because in this region, changes in signal propagation are strong. This means that signals from AM broadcasts, ham radios, and even GPS can experience strong effects in the F-region. Combining the ionosonde data with data from GPS receivers, the Ham Radio Reverse Beacon Network, and Virginia Tech's SuperDARN radars, will allow Earle and his team to improve ionosphere models and better understand the effects of the eclipse on the F-region of the ionosphere. The third ionosphere-related project is focused on the lowest, least dense region of the ionosphere called the "D-region", and is led by Dr. Robert Marshall at the University of Colorado at Boulder. His team recognizes that the D-region is the least understood of all the regions of the ionosphere, and yet is it the most important region for long-range, very-low frequency telecommunication transmissions. The team will use radio transmissions sent from North Dakota, and monitor the transmissions at receiving stations across the eclipse path in Colorado and Utah. The resulting data will be compared to those of space-based missions like NASA's Geostationary Operational Environmental Satellite (GOES), Solar Dynamics Observatory (SDO), and Reuven Ramaty High Energy Solar Spectroscopic Imager (RHESSI). These measurements combined will tell scientists how the ionosphere is changing and provide insight on its composition. 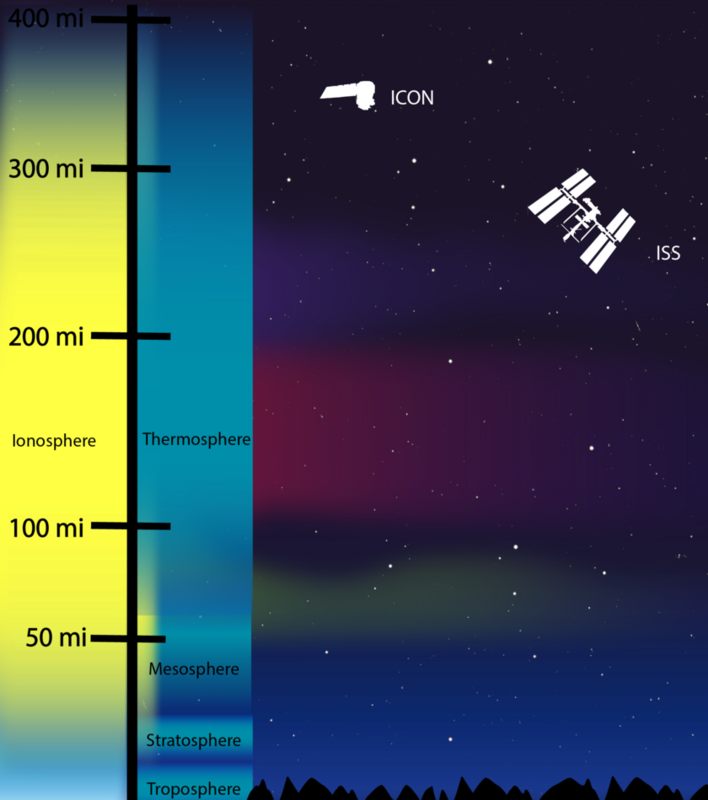 Altogether these missions seek to precisely characterize the effect of the sun's radiation on the ionosphere, an important—but often overlooked—portion of the Earth's atmosphere. Improving our understanding of this region—how it works, how it interacts with the sun and with the Earth's surface, and how it influences us—will be key to building better space technology in the future. From improving how signals might propagate through the region, to how space stations and LEO satellites can deal with space weather, the information we'll glean from these three (and all 11) experiments will better prepare the engineering of the future.